FULTON, NY – Karrie Damm, executive director for the Child Advocacy Center of Oswego County, announced that the CAC was recently awarded a $250,000 grant from the Richard S. Shineman Foundation. The grant serves as the kickoff to the CAC’s capital campaign to fund its new location in Fulton. The Child Advocacy Center of Oswego County recently received a $250,000 grant from the Shineman Foundation to kick off its capital campaign. From left are: Richard S. Shineman Foundation Senior Administrative Assistant Penny Halstead; Richard S. Shineman Foundation Board Member Kathy Fenlon; CAC Executive Director Karrie Damm; and Richard S. Shineman Foundation Executive Director Karen Goetz. Predicated by the increase in cases of physical and sexual child abuse that the CAC is handling, the much larger facility will increase efficiency in investigations and in helping victims and their families cope with the process. “When Karrie contacted me about the plans for the CAC’s location I visited its current site and it was clear to me that the CAC had indeed run out of space. It was difficult for collaborating agencies to get together at that site. At the CAC’s new location each agency will have its own work area. There will also be more interview rooms and conference rooms. Bringing these agencies together under one roof allows them to work as efficiently and effectively as possible,” said Shineman Foundation Executive Director Karen Goetz. 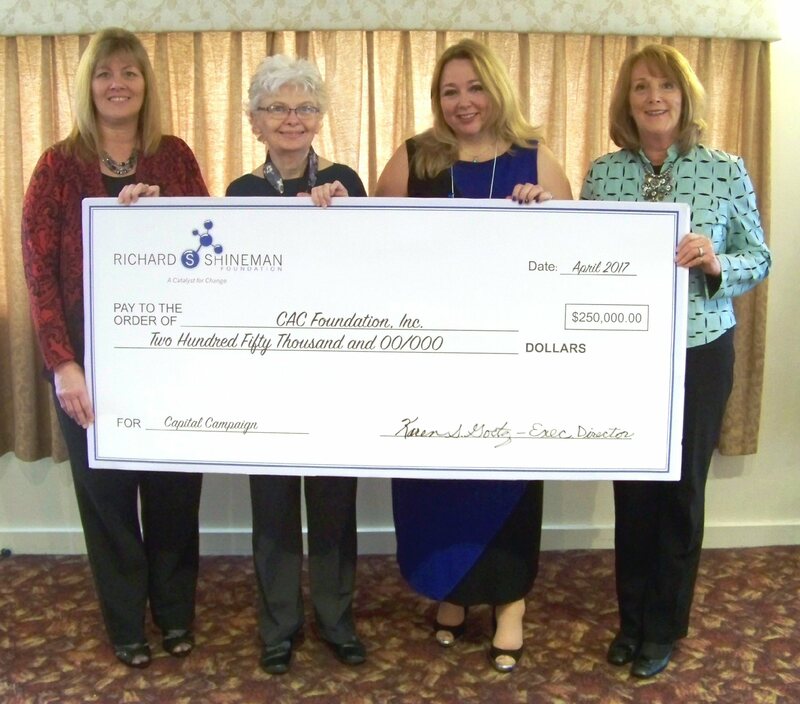 This current grant marks the third time that the Richard S. Shineman Foundation has provided funding to the CAC. Past grants were awarded for community education and state of the art technology to assist with investigations. Since its establishment in 2013 the Richard S. Shineman Foundation has awarded for than $4 million through 153 grants to 82 organizations. Goetz said that when the foundation’s board of directors reviews the organizations’ reports on how successful its projects have been they always hope the results will be as anticipated. “With the Richard S. Shineman Foundation’s mission of being a catalyst for change, providing funding for the CAC is perfect match as it is certainly a catalyst for change in its own right. We are honored to be able to provide this grant to help them in their mission to help victims and their families heal, and through education, empower the community to help them eradicate child abuse in Oswego County,” added Goetz. Located at 301 Beech St., with a satellite office at 4822 Salina St. in Pulaski, the CAC of Oswego County is a non-profit charitable organization that works hand-in-hand with local law enforcement, prosecution, child protective services, medical providers, therapy providers and victim advocacy professionals in Oswego County to protect and serve children that are victims of sexual and physical abuse. For more information on the Child Advocacy Center of Oswego County, call 315-59CHILD (592-4453) and follow them on Facebook.